Sorry about the title. I had to. Really, what other opportunity would I have to recount one of the worst movies in history (2.7/10 on IMDB). A movie so bad, Madonna looked like the veteran actor in the ensemble. At any rate, my surprise in Asia’s land of the smog appeared on the bustling pedestrian shopping zone, Nanjing Road. 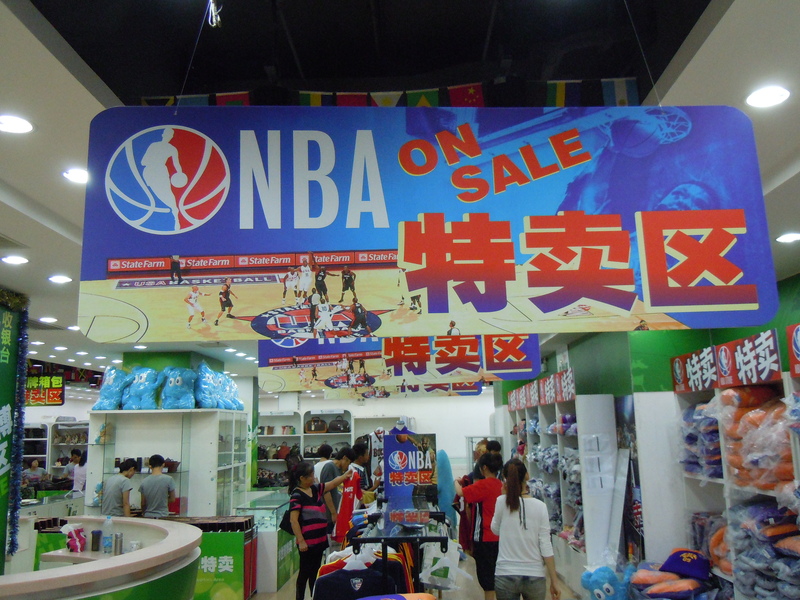 I came across a sign that said ‘NBA Store On Sale’. This doesn't look like the 5th Avenue store to me. Even the logo is a bit off. I walked in to find what looked like a Woolworth only with different stations selling discounted gear. One of those was festooned with cheap looking NBA signs and authentic NBA gear piled high on shelves, in baskets and on racks. A quick perusal through the jersey rack revealed warm-up tops of players who had since switched teams. Now we know where all of those end up. 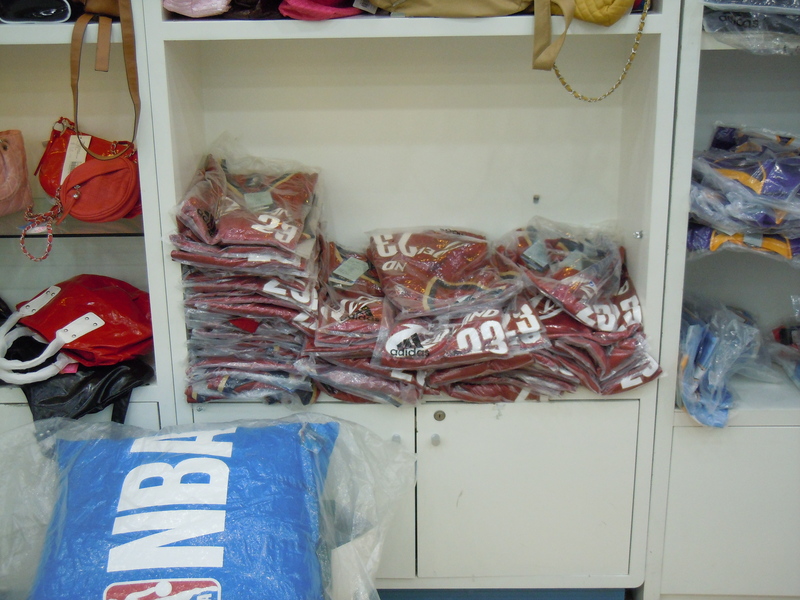 Loads of Lebron Cleveland Cav jerseys priced at 80 Yuan each ($12.5). Same for Michael Redd Milwaukee Bucks jerseys, ‘Melo Nuggets tops and those of a few other traded players. No Yao jerseys, but I did see a few Dwayne Wade Heat and Kobe Lakers jerseys going for the same price. The gear looked original as far as I could tell. It was a total steal. Erm, excuse the pun. These would make great doormats in Cleveland. I settled on a pillow in the shape of a stuffed New Jersey Nets jersey (number 9, the since traded Vince Carter) at 20 Yuan ($3.10). On the way out, I wondered out loud why the NBA would set up such a crappy store in what they consistently call their biggest future market. Then the light bulb went on and I realized the place was probably completely unauthorized (yeah I was a bit slow that day), even though it had a sign displayed on the busiest shopping street close to all the five star hotels. Gotta love China! 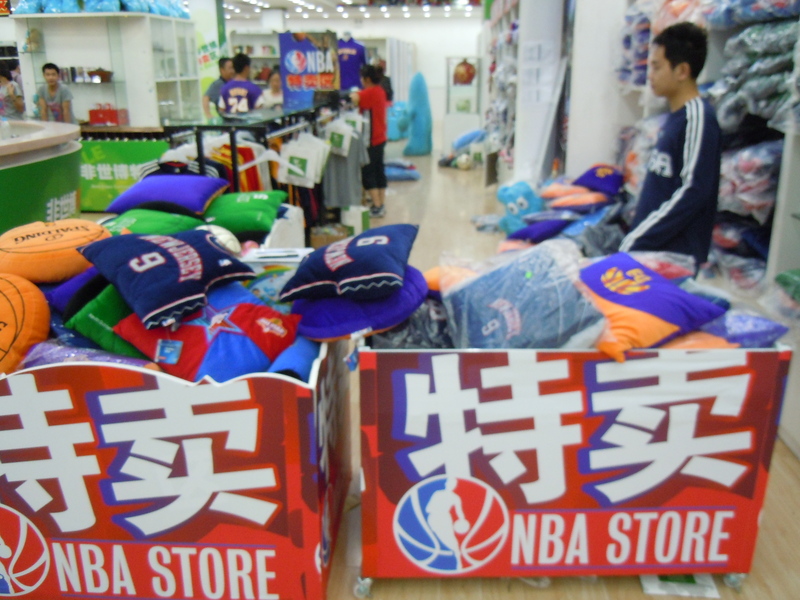 Needless to say most, if not all, NBA licensed merchandise is made in China so the fact that a few of them ‘fell off the back of a truck’ shouldn’t surprise anyone. On another note entirely, I forgot to mention in my last post that I visited a very cool retro sports bar in Tokyo’s Roppongi district. From what I gathered, Roppongi’s your best bet for a late drink in Tokyo. Sadly, its nightlife district had deteriorated miserably since the last time I had been in Tokyo many moons ago. It was overrun by street people hustling ‘massages’ (a common theme across Asia) and flyers for sleazy bars. I'm 100% sure I'm taller than Cal and I've never had milk in my life. The only civilized place I could find to get a drink (albeit an expensive one at $15 for a pint of beer) was a sports bar called Legends off the insane high street. The great part was that it was a shrine to old baseball memorabilia. 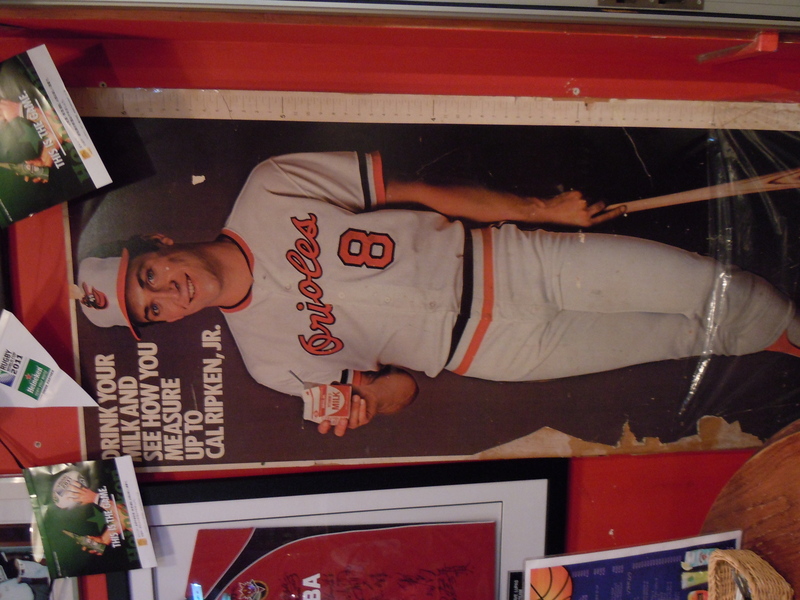 A life-size poster of Cal Ripken in his heydey with a built-in measuring tape for kids to chart their growth. There were also throngs of old baseball cards which brought back fantastic memories of growing up in New York and salivating over finding a Yankee in a pack of Topps cards. I actually recognized a few of the cards like ‘future all-stars’ singling out George Brett and Robin Yount (yes I’m a sad geek). Sadly, I lost mine years ago. Still annoys the hell out of me. But unless you’re desperate to watch an American sporting event, I’d avoid that section of Roppongi altogether. I wish I could recommend a great sushi place in Tokyo, as that’s what everyone’s looking for. But the one sushi meal I had was on the other side of Roppongi, in a posh enclave known as Roppongi Hills. Dinner at Roku Roku in the Grand Hyatt set me and my friend Khalid back $750. My best advice is don’t bother converting the bill ’till you get back home. Apparently I’m the Frugal Fan, but not the frugal sushi eater. I think it’s so rampant that the fear of getting caught carries the same weight as someone downloading off limewire.